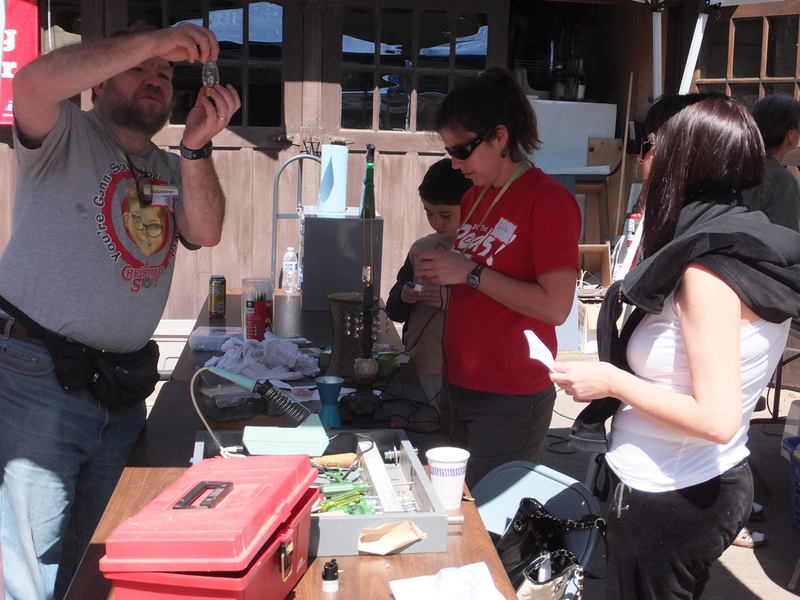 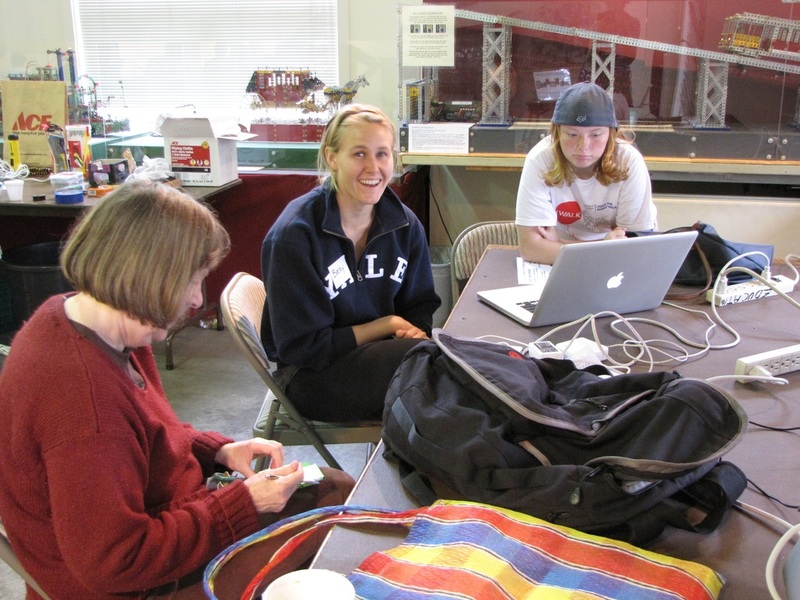 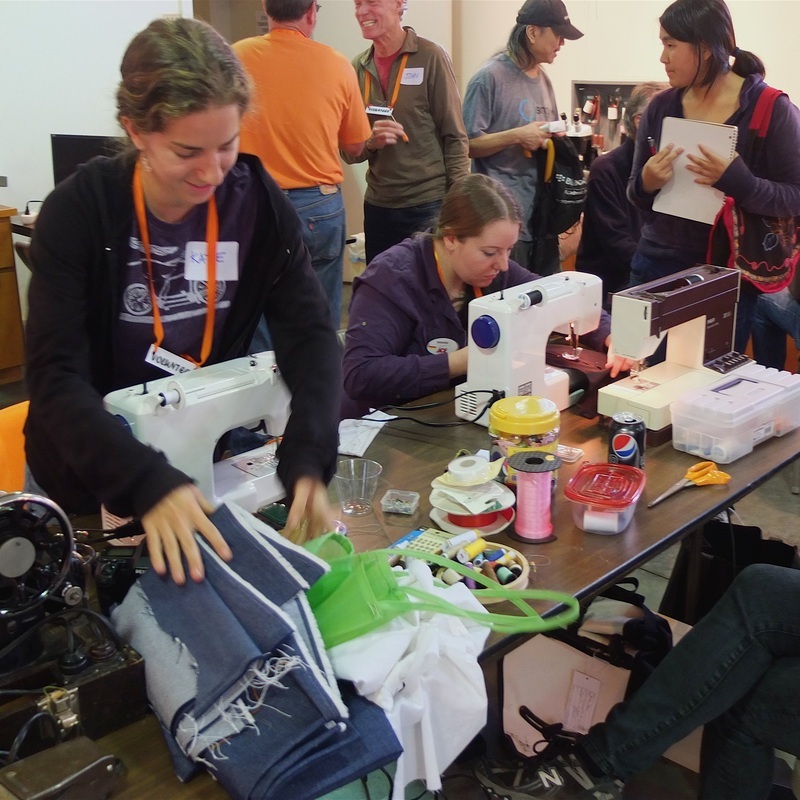 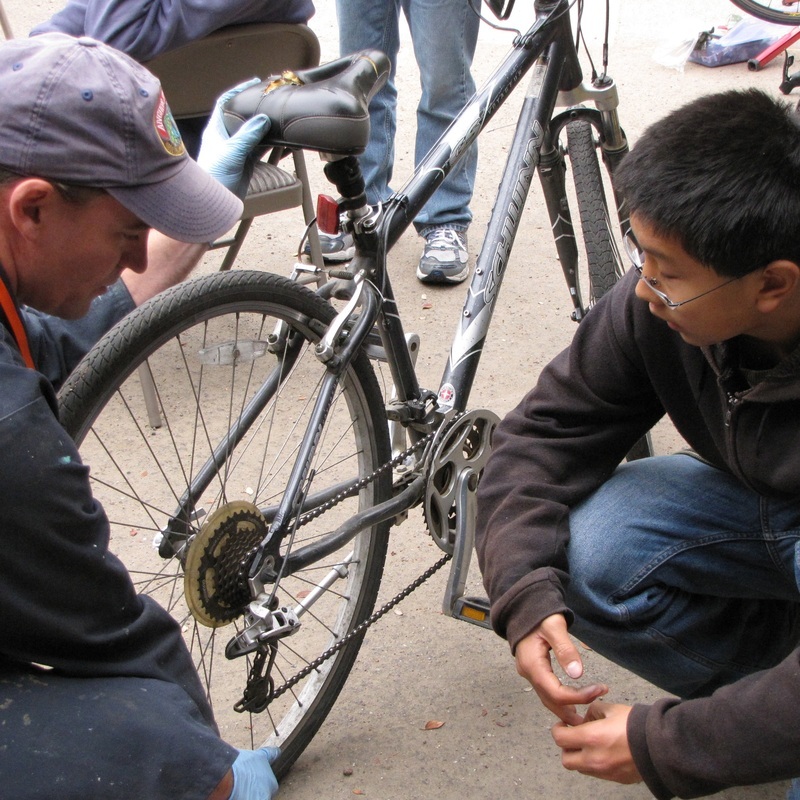 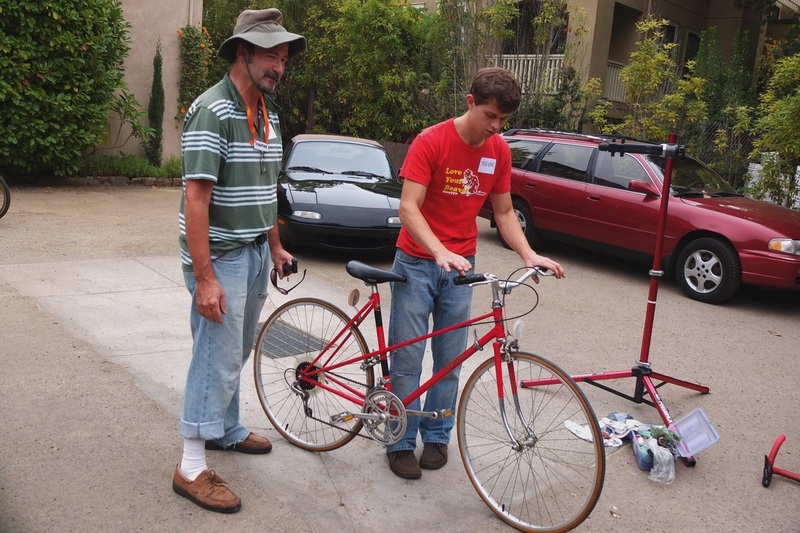 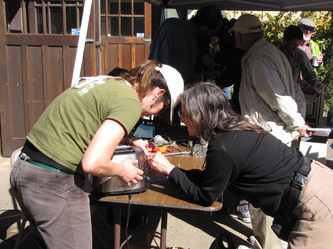 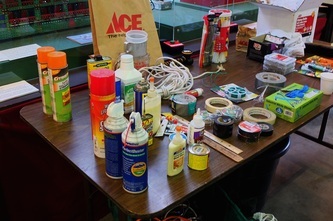 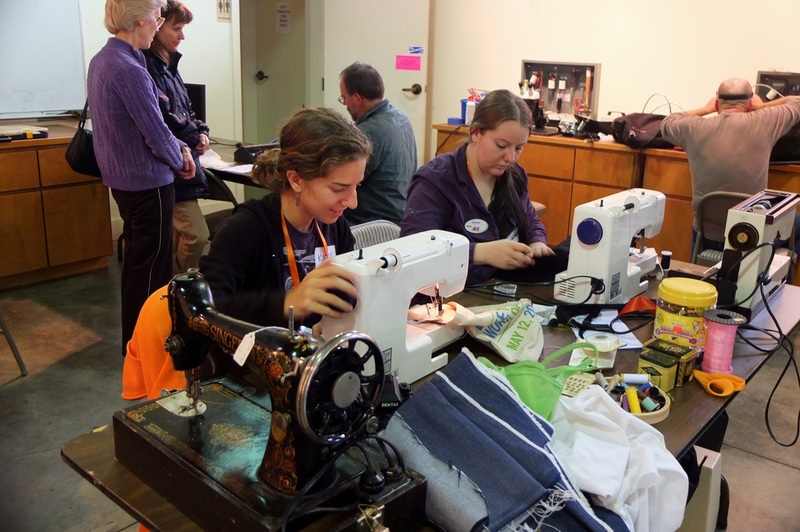 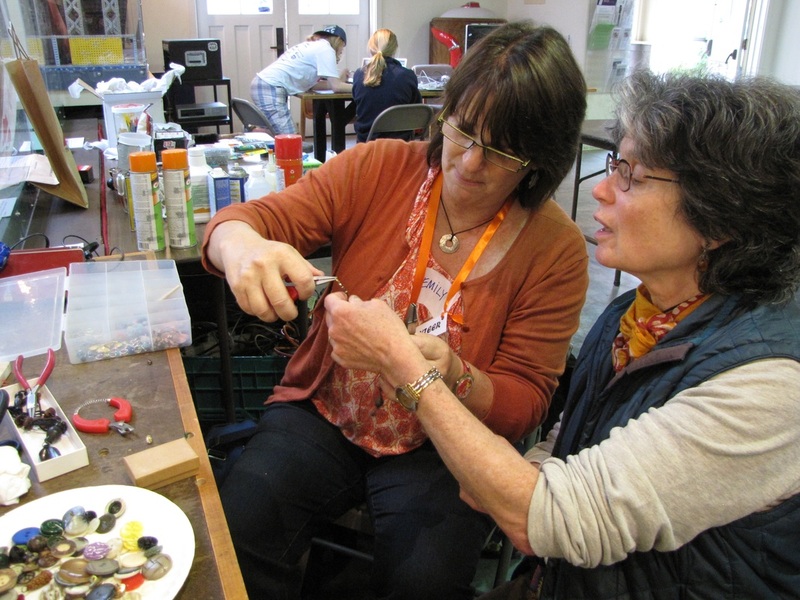 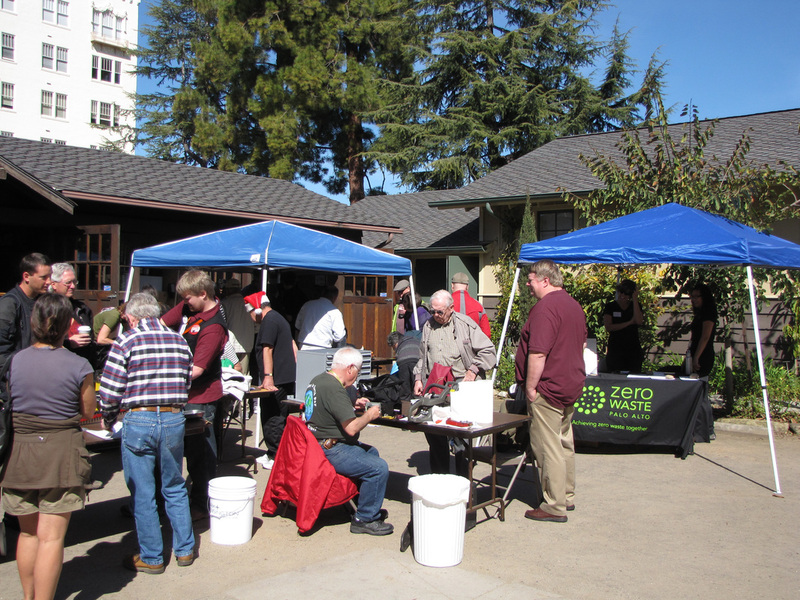 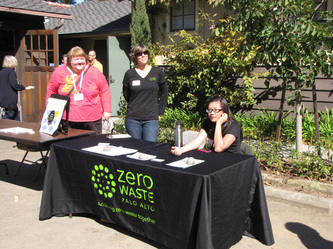 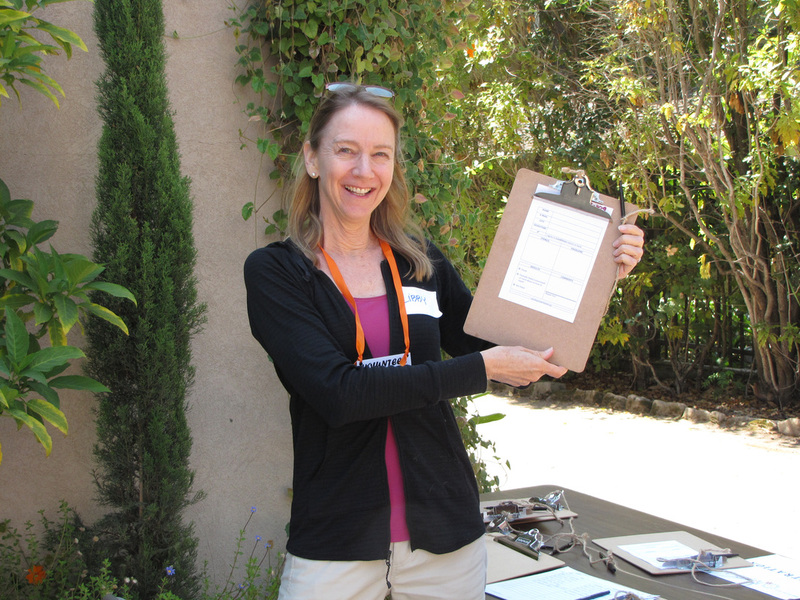 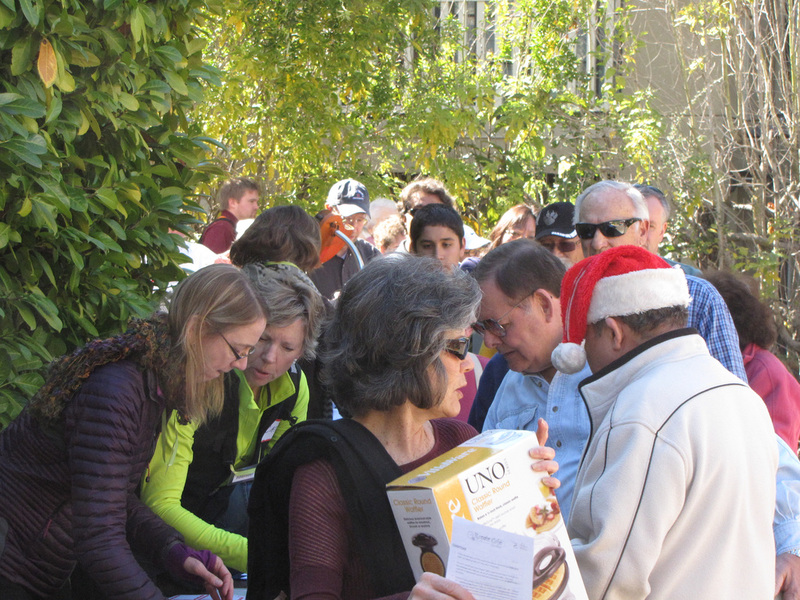 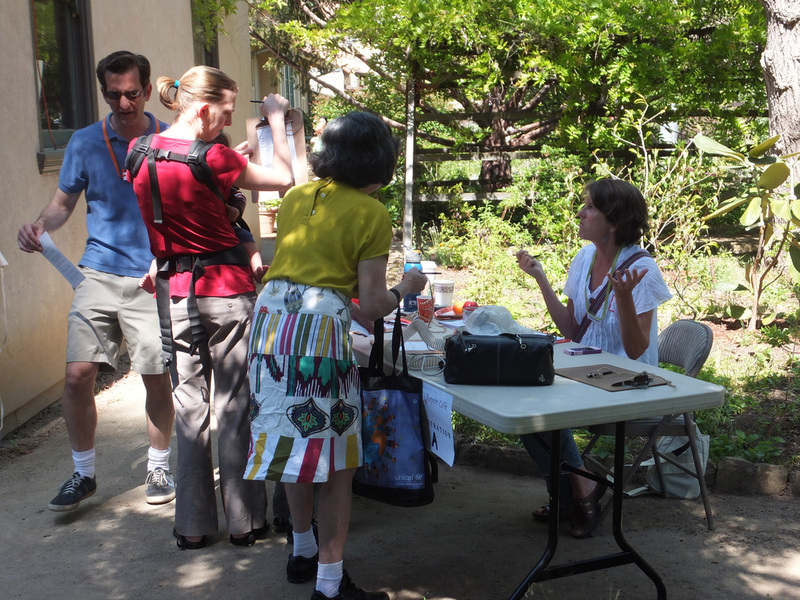 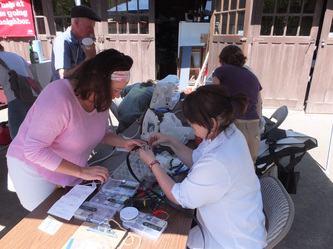 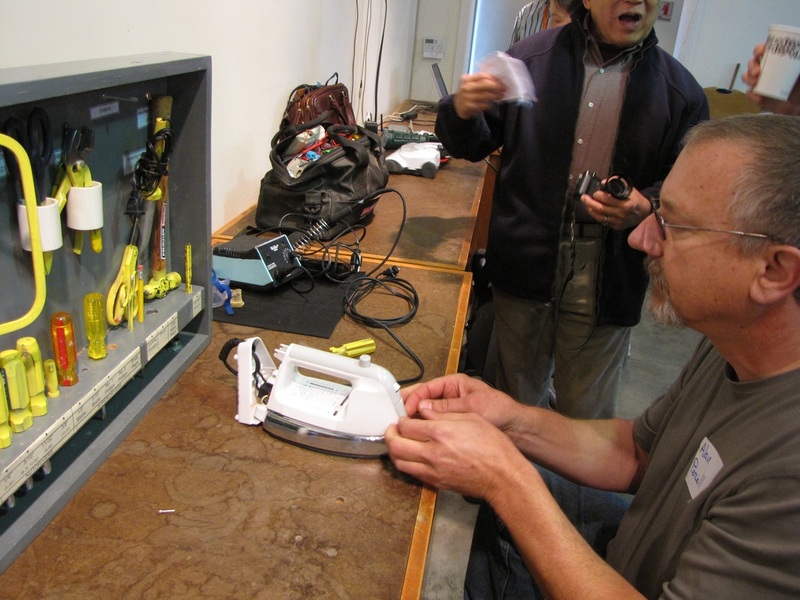 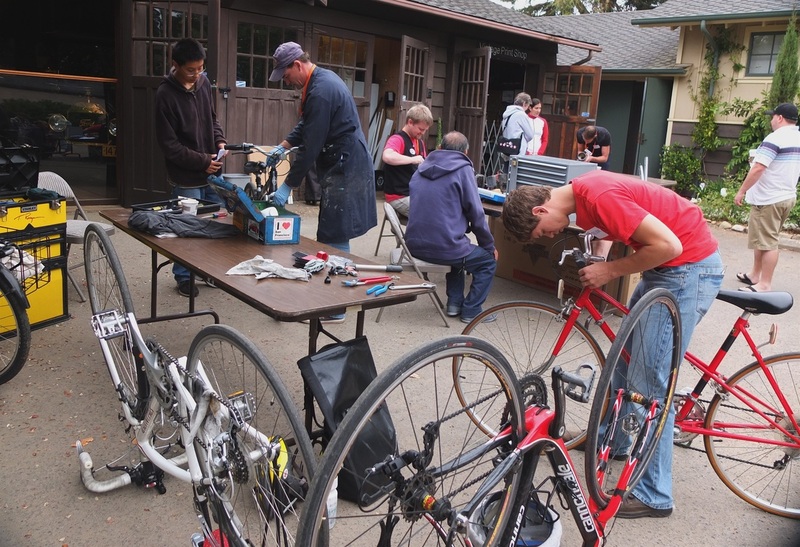 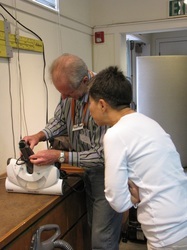 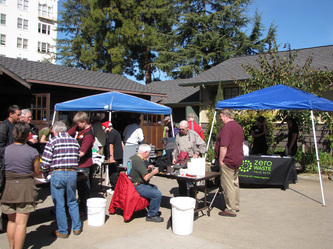 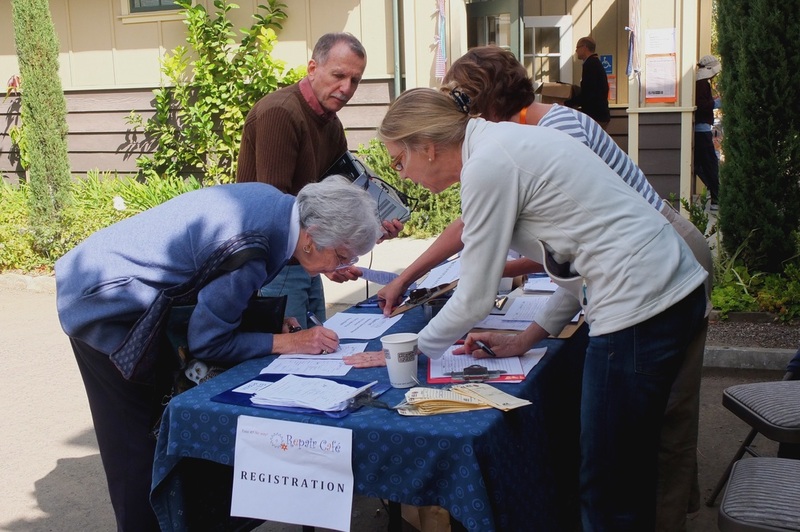 The Repair Cafe Palo Alto volunteers had a very successful day! 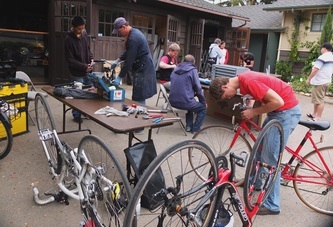 Drew, Matt, and Rich fixed 8 bikes, Drew McGuyvred a fabulous furniture repair and Catalina and Sue shared the word about the Repair Cafe movement with other organizations and many of the nearly 150 people who attended. 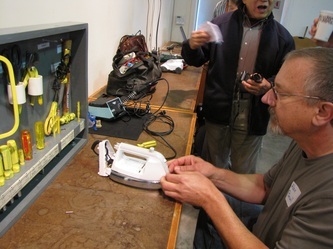 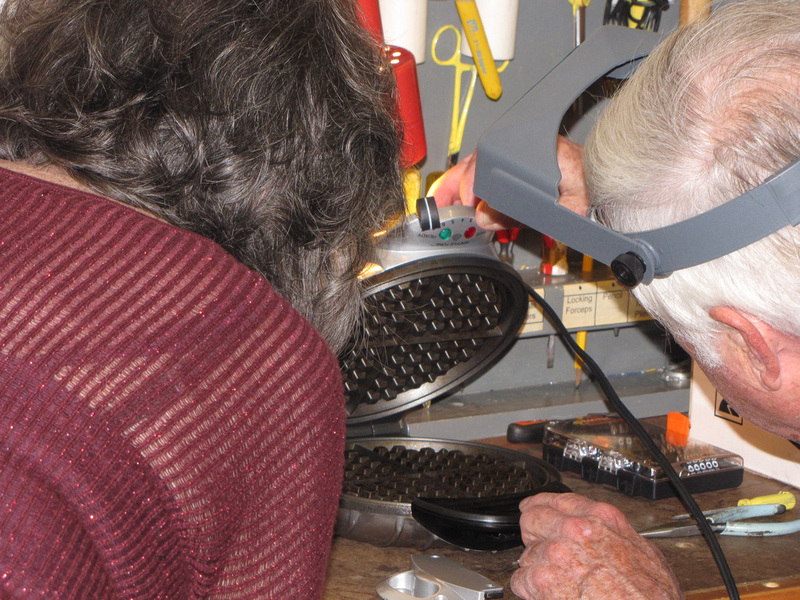 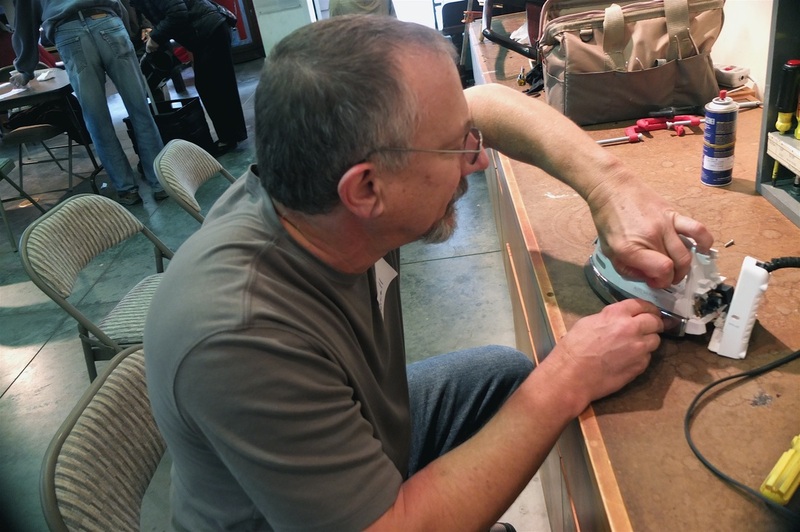 Our 4th Repair Café in Palo Alto went off without a hitch. 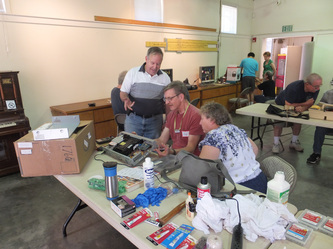 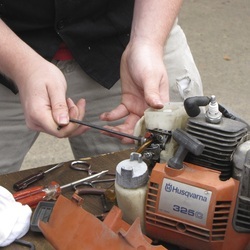 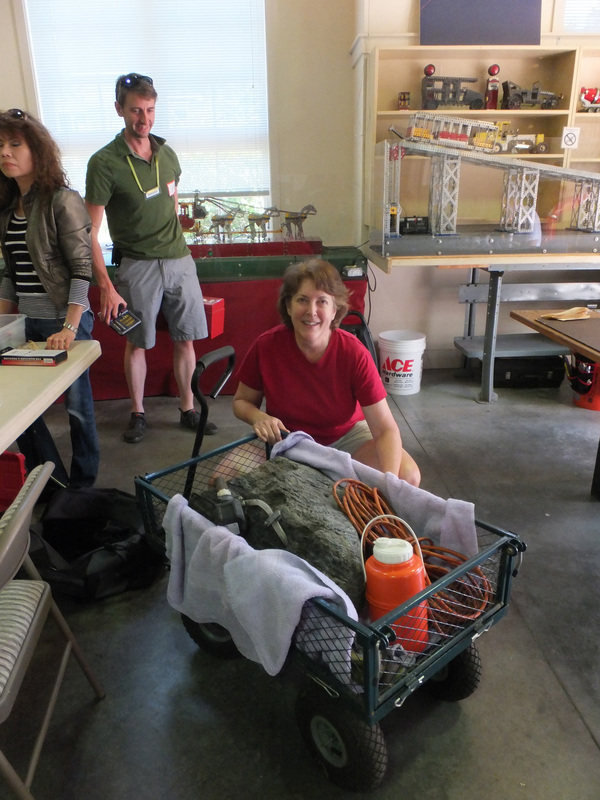 A well-staffed volunteer corps and, by now, a well-oiled process flow enabled a moderate but steady flow of visitors to have their repair items tackled expeditiously. Thanks to everyone who participated in yesterday's Repair Cafe. 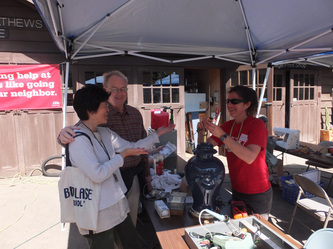 We had the usual eclectic collection of stuff come across the transom - bikes, clothing, cameras, cell phones and computers, lawnmowers, luggage, lamps, toasters, cd players and microwaves. 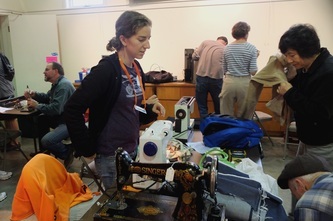 We also saw 3 broken sewing machines and a nerf gun. We even had a brush with a Silicon Valley legend – see my blog post here. 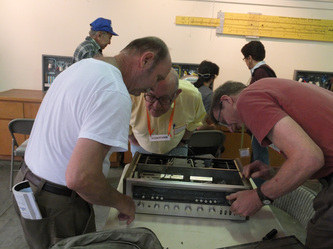 for repair and have so many volunteers show an interest in making this family relic work correctly. 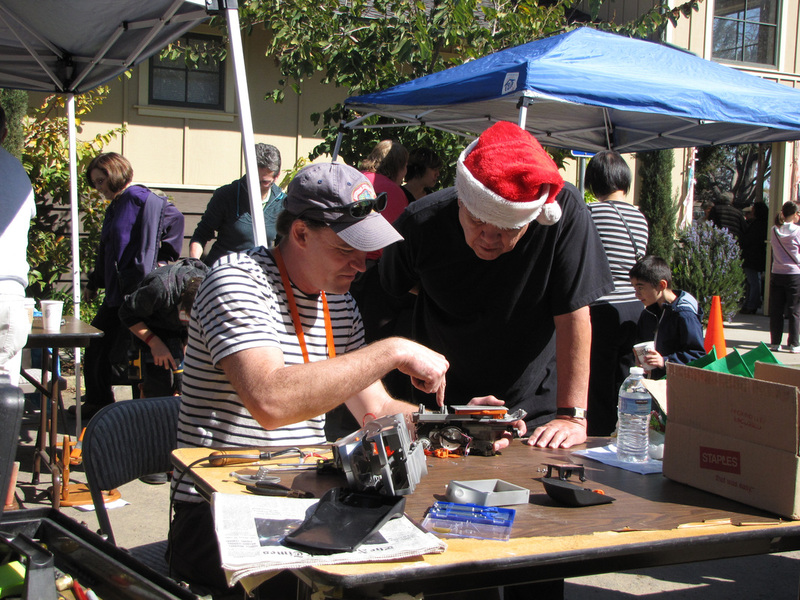 At Sunday's Repair Café over 300 people showed up, thanks in part to a front page story in the San Jose Mercury News and its affiliated Bay Area news outlets. 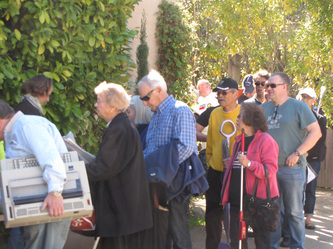 At one point there was a queue of people snaking down the street to the corner of Homer and Waverley Streets. 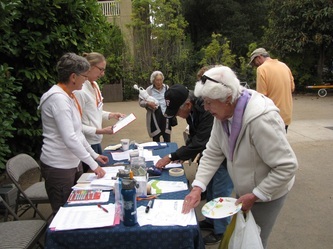 About half way through the event, we stopped registering new visitors because it was clear we would not make it through the work. 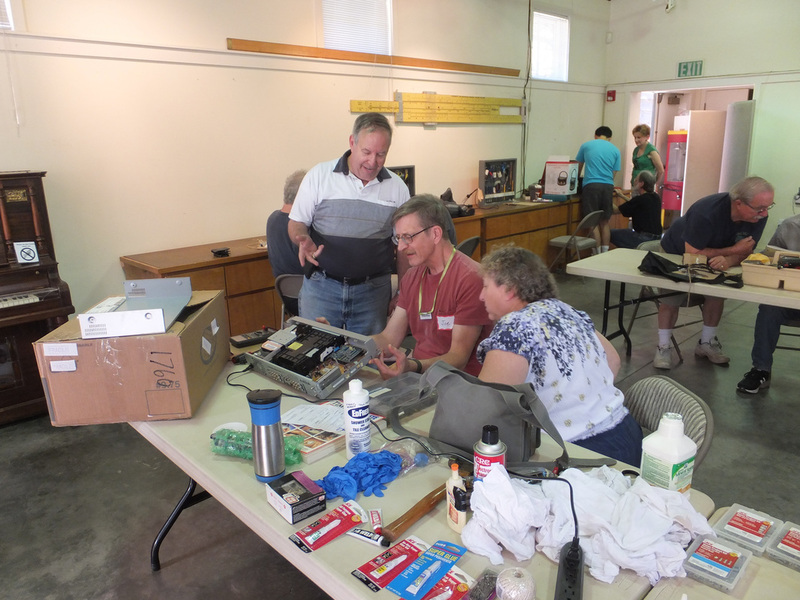 By the end we were able to work with about 200 people - many having multiple items to repair. This total was roughly twice the number of our first event in October. 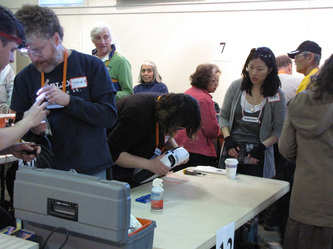 We began the day with about 45 volunteers and added another ten or so throughout the day as people came in and offered to roll up their sleeves and help. 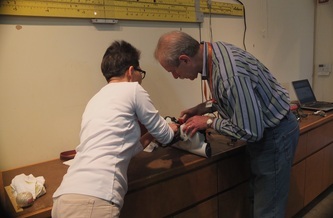 We needed every body. 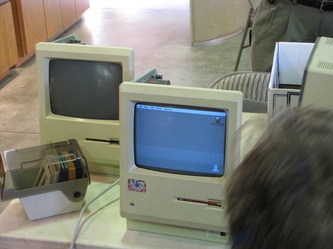 Items fixed included lamps, computers, CD players, even a toaster from the 1930s. 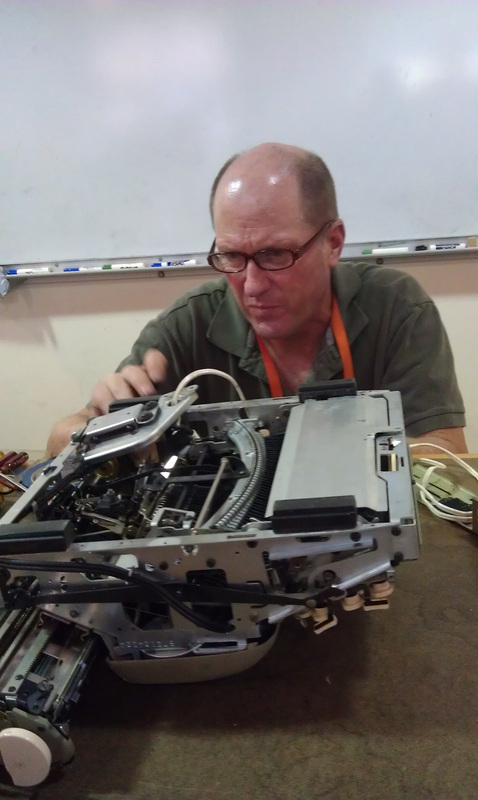 We fixed many things; couldn't fix others. 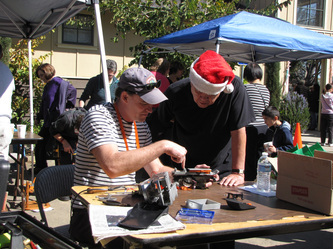 But everyone who came seemed to relish the community spirit the Repair Cafe embodies. 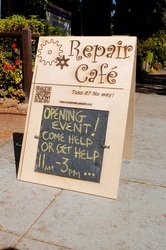 We are, of course, delighted there is such interest in the Repair Cafe. 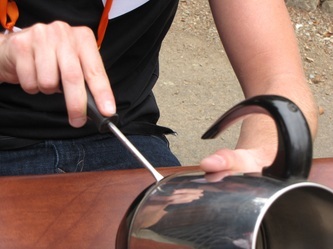 Clearly, this is something that resonates with many, many people. 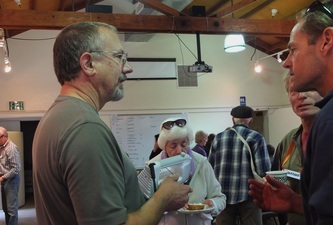 People came from miles away, which suggests to us the need for more such events throughout the Bay Area. 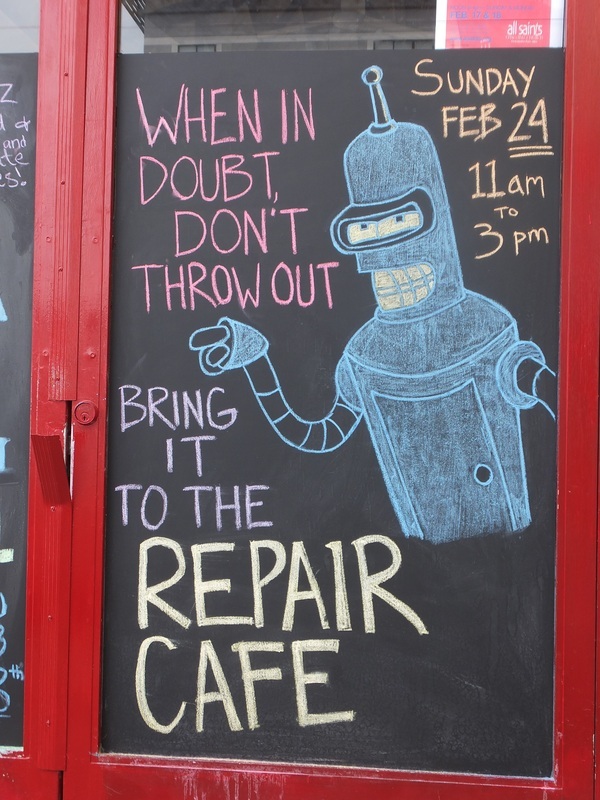 To that end, we are actively seeking others who would be interested in establishing Repair Cafes in their own communities. 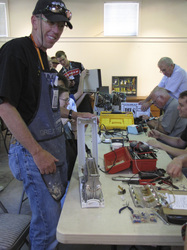 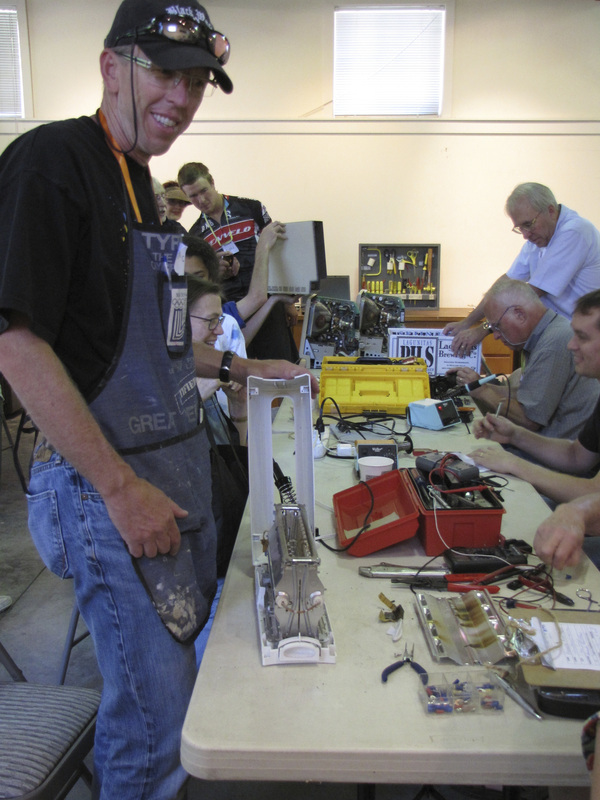 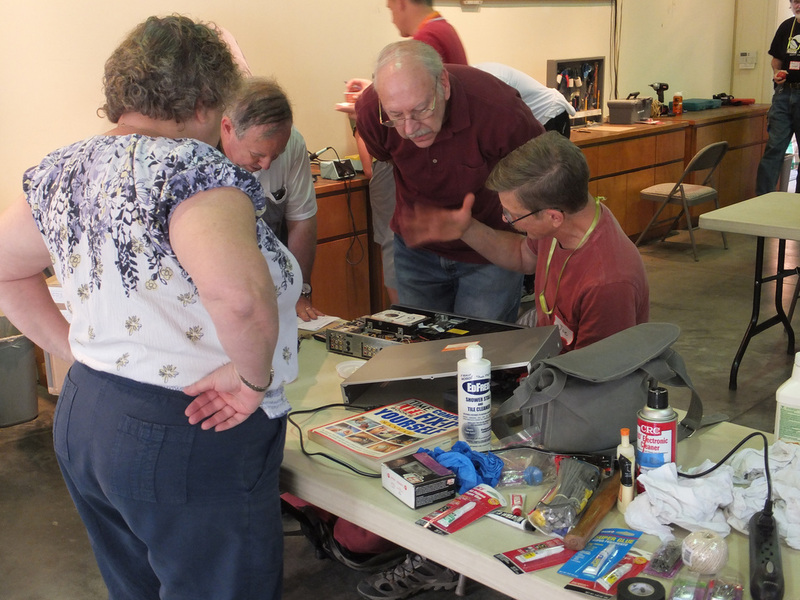 We had a fantastic kick-off event of our Repair Cafe on Sunday, October 14. Over 100 visitors came, many of whom brought in multiple items. 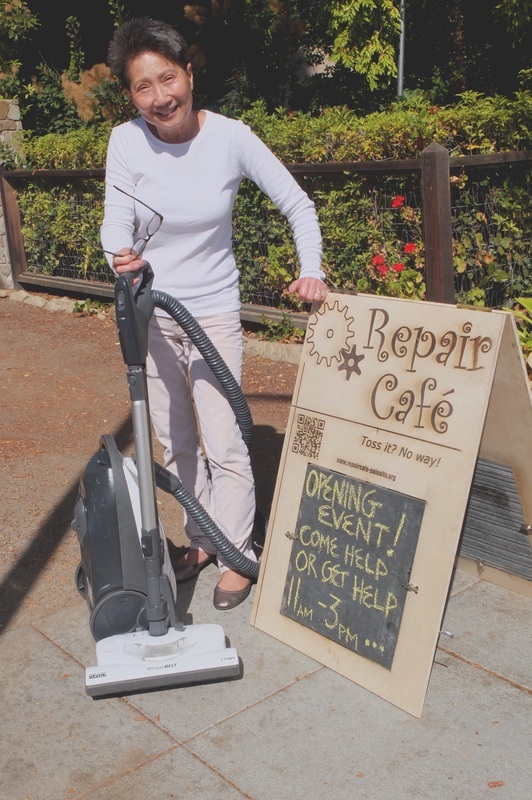 We worked on vacuum cleaners, bikes, clothing, jewelry, electronics, furniture, laptops, lawn mowers and many other miscellaneous things. 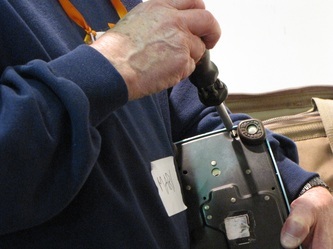 We had a clock that ran backwards, microwave ovens that defied logic and many, many broken lamps, We were able to help the owners repair, or figure out how to repair, about 2/3rds of the items they brought in. 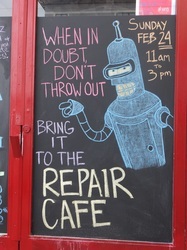 Not a bad fix rate. 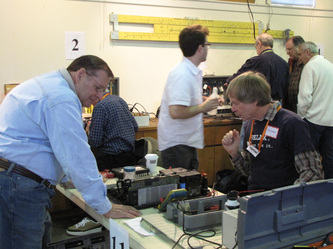 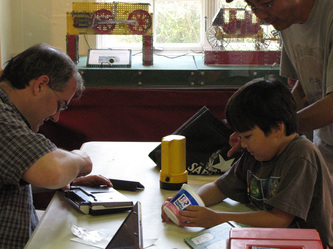 Visitors to the Repair Cafe were delighted. It seems we really struck a chord with people - not only touching their desire to do something positive about their accumulated, broken stuff, but also appealing to the desire people have for this kind of community participation. 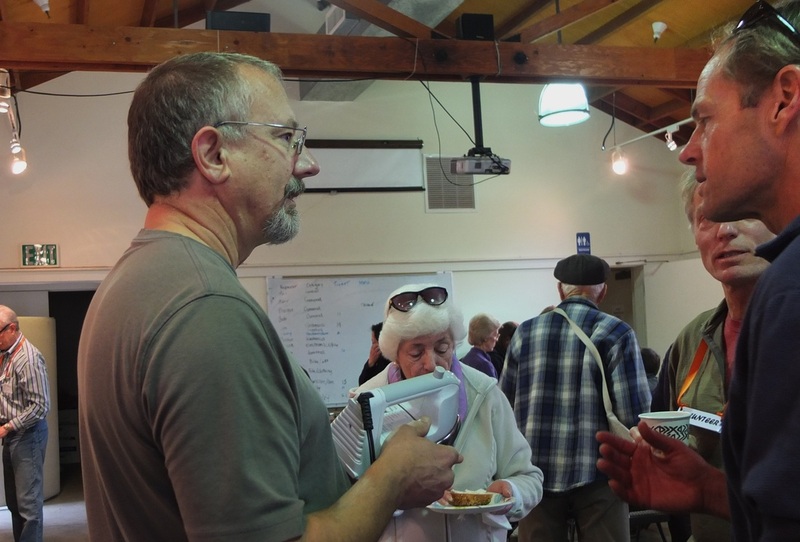 The event also sparked lots of ideas among different people who came by - partnerships with other community groups, a community tool library, and advice on how to do things better next time. 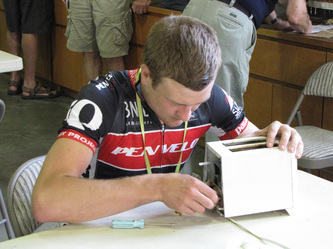 Most of all, though, everyone just had fun doing this. 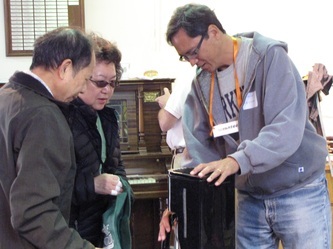 A few days before our opening we had two local newspapers write stories, one local television station (NBC - San Francisco Bay Area) run a story and one interview on local radio station (CBS - also San Francisco Bay Area). The television and radio pieces ran multiple times throughout the weekend of our kickoff. Links to one of the stories and the radio interview are on our About page. We had 30 volunteers for this event. 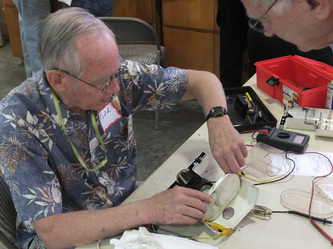 Eighty percent were hands-on repair volunteers; the rest helped with registration, hospitality and problem solving. Most enlisted in advance, but some just showed up and pitched in on Sunday. 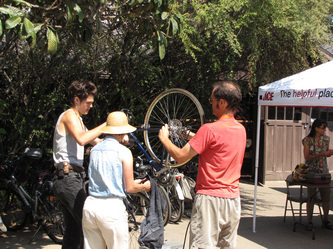 We needed every body! 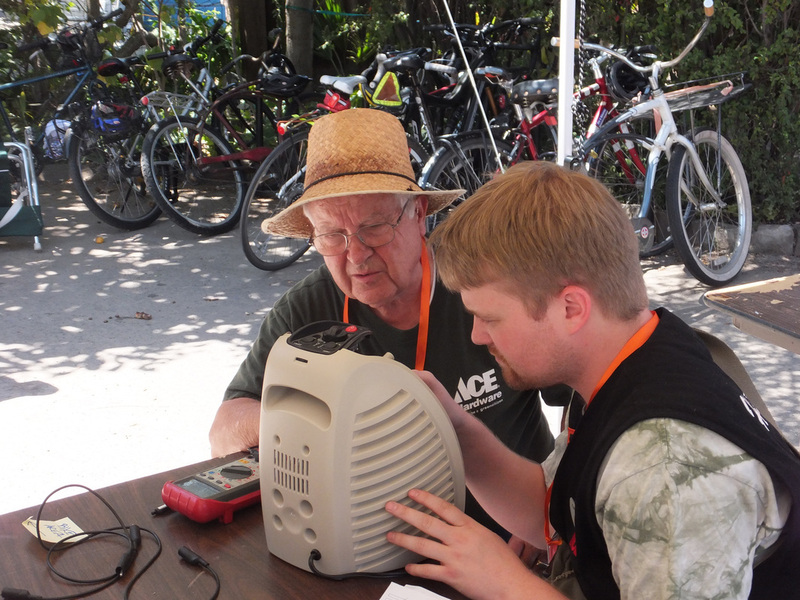 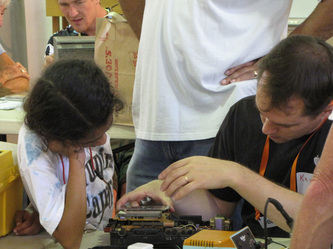 We found small electronics to be the most time-consuming and could have used more people skilled in that area. 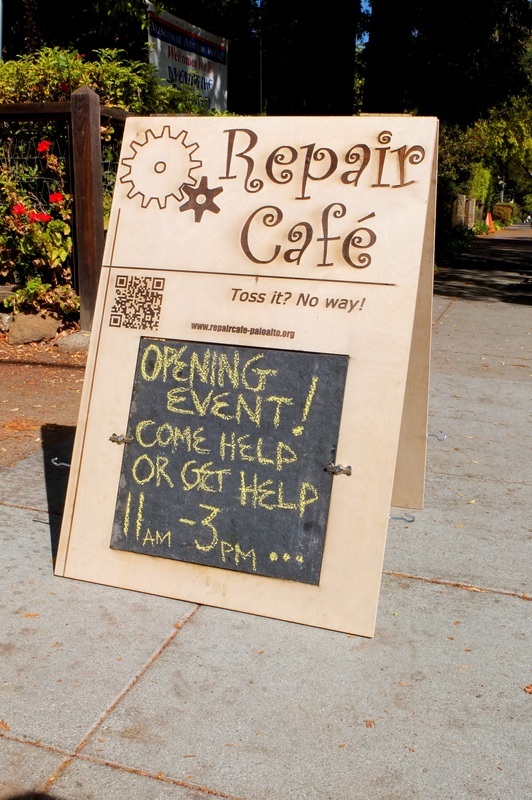 We were fortunate enough to find a handful of local businesses to support our Repair Cafe. 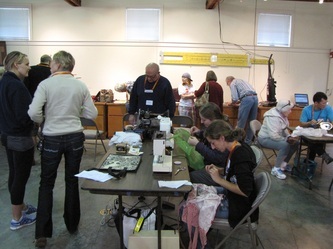 Two in particular were critical: The Museum of American Heritage (www.MOAH.org) provided us space to host the event. 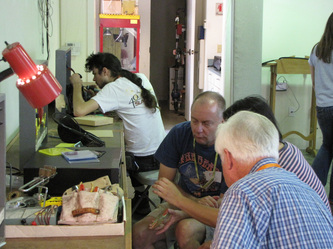 They have work benches, tables, tools and a fantastic attitude about supporting our project. 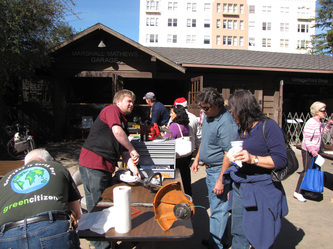 The other important partnership was the Hassett Hardware (formerly Palo Alto ACE Hardware.) 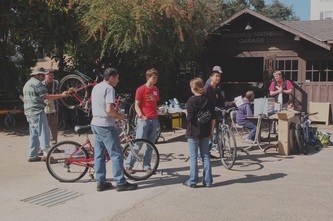 The store helped us plan the event, provided 3 staff members for the day and set up a bike courier system to fetch parts from their nearby store. In addition to these two, we had a local coffee shop donate coffee (Peet's Coffee & Tea) and a bagel shop (House of Bagels) donate bagels. Please show your support for these great community resources and thank them for their help.